"Foreign Service Institute Korean Basic Course Volume 2. Text is entirely in Hankil (hangul) or Korean orthography, and in English; no romanized transcription of Korean is used. 15 CDs or 16 audiocassettes (17 hrs. ), 560-p. text. Recorded by native speakers with pauses for you to repeat. Try this course at no risk, 3-week full money-back guarantee. Order securely with full privacy protection. Be sure to specify whether you want CDs or cassettes. " 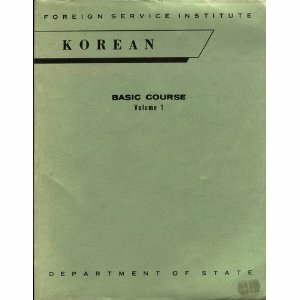 Volume 1 of the U.S. State Department Foreign Service Institute Korean Basic Course. Intended specifically for Englis speakers, this course teaches the national standard language as spoken by educated Koreans, a form that is understood throughout the country. The Korean Hankil orthography is gradually introduced. Reissued in 2005 on 12 audio CDs (13-1/2 hours of recording), accompanied by a 553-p. text. Product No. AFQ800D. By the authors of Functional Korean Active Korean will enable the learner to develop skills and strategies for manipulating the Korean language and to express one's intended messages and meanings effectively by explaining grammar thoroughly and featuring the three speech levels in various situations. With ample cultural notes and illustrations, this book will help the reader to learn to communicate in Korean. And you will find this book as entertaining as it is educational. This set of 'Yonsei Korean' is an integrated collection, made up of various kinds of tasks and activities as well as focused practices of vocabulary and grammar. These practices enhance all of the four communicative skills: listening, speaking, reading and writing. The interesting topics and situations discussed in the textbooks will enable learners to perform a wide range of communicative functions using the Korean language. Korean grammar for international learners. Korean and English 한국어를 외국어로 배우고 익혀서 올바르게 표현하려면, 그것이 가지고 있는 일정한 규칙 즉 문법이 잘 정돈되어 있을 때 가능해진다. 이러한 연구가 언어학적 이론과 문법적 분석으로 뿐만 아니라 실제로 교수-학습 현장의 문제도 함께 고려되었을 때 비로소 외국어로서의 한국어 교육이 효율적으로 이루어진다고 본다. 필자는 30여 년 동안의 한국어 교육 현장에서 실제로 경험하면서 수집하고 다듬어 온 자료를 바탕으로 외국인을 위한 한국어 문법책을 펴내게 되었다. 이 책은 전문적인 언어학적 이론보다는 한국어를 배우려는 외국인을 위하여, 한국어 문법에 대한 전체적인 체계를 제시하는 실용적인 목적으로 쓰여진다. 따라서 간단한 문법 이론과 함께 그에 해당하는 자료와 예문을 제시하여 이해를 돕고자 하였고, 별책으로 Workbook을 두었다. Despite the fact that they are spoken by millions of people, languages such as Korean or Turkish are not usually offered in schools or colleges. The Critical Languages Program (CLP) at the University of Arizona was created to meet the need for interactive instruction in these less-commonly-taught languages. In order to meet the needs of a wide variety of learners who wish to gain proficiency in some of these languages, CLP has developed a series of CD-ROM courseware beginning with Brazilian Portuguese, Cantonese, Kazakh, Korean, Mandarin Chinese, and Turkish. CD-ROMs for other less-commonly-taught languages are planned for the future. Each package contains two CD-ROMs with a total of twenty lessons for the beginning learner, consisting of video dialogues and readings by native speakers, thousands of audio recordings, graphics, and extensive notes. Handy browser features enable users to go back and review words and pronunciations and to access five types of exercises: multiple choice, fill-in-the-blank, audio flashcard, pronunciation, and listening dictation. These exercises enable users to test and improve their knowledge of each lesson. Learners with microphone-equipped computers can record and play back their own voices and then compare their pronunciation with that of the native speaker. With the click of a button, learners can hear native speakers pronounce words or phrases, facilitating quick comprehension of these challenging languages. Each package of two CD-ROMs contains the equivalent of a textbook and workbook with audio and video components, making it practical for either self-instruction or directed educational, governmental, and business purposes. "Please note that this is the new version of Elementary Task-Centered Listening Comprehension of Korean. This book is intensive listening comprehension course for beginner to advanced beginner-level students. It makes learning Korean as well as listening to Korean easy and fun. This book is intended to help the learner listen for meaning not listen to every word to do a task but the overall message of what someone is saying." Practice of basic Korean with creative learning exercises and 30 minute audio.